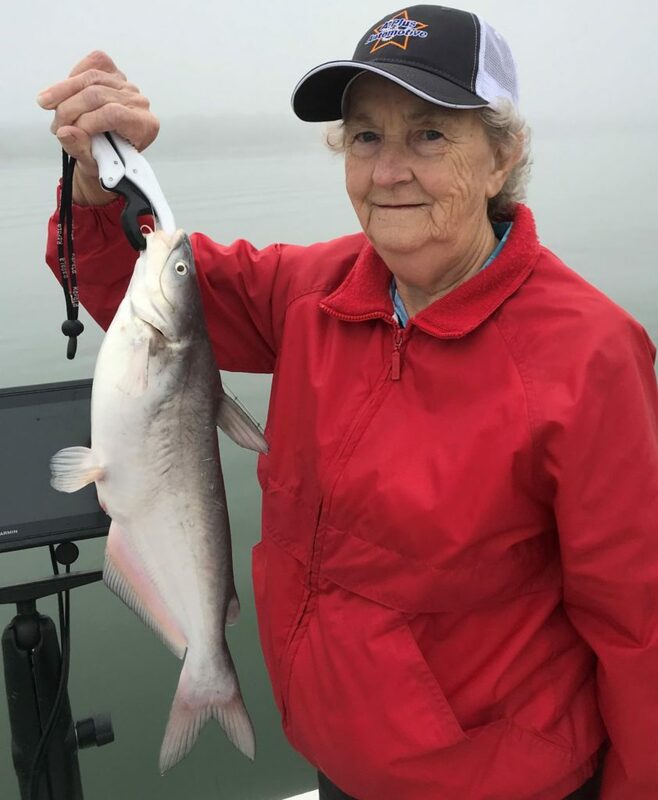 WHO I FISHED WITH: On Friday, April 5th, I fished with Don and Linda Hutto who were treating Don’s parents, Tom and Jenean Hutto, to a fishing trip. Don’s folks had flown in from Claxton, Georgia, which is about 50 miles NW of Savannah, to attend an outdoor wedding on the 6th for Don’s son, Heath, and his fiancee’. When I asked Jenean what made Claxton tick, she told me “Fruitcakes.” Thinking she was referring to corrupt local politicians, I kind of chuckled. Then she let me know she was serious. There are two of the nation’s best know fruitcake bakeries right there in Claxton — Claxton Bakery, Inc., and the Georgia Fruitcake Company! 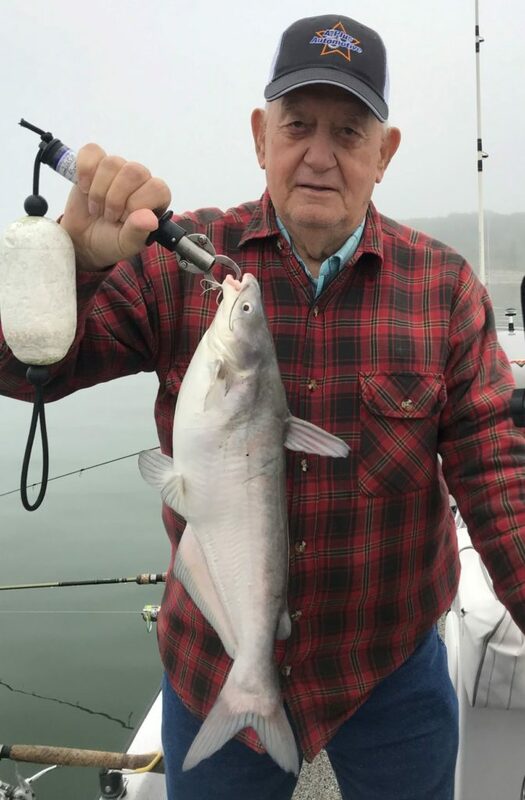 PHOTO CAPTION: Tom Hutto of Claxton, Georgia, landed this 4 pound class bluecat on shad under foggy, calm conditions. PHOTO CAPTION: Tom’s wife, Jenean Hutto, took this 3-pound class bluecat just minutes before Tom landed his nice blue. HOW WE FISHED: Fishing was sub-par this morning. We had a light NW breeze and heavy grey cloud cover right at safe light. We caught most of our fish under these conditions via vertical jigging. Linda did the best with this tactic as she was meticulous about keeping her slab adjusted to just the right height off bottom. During this time we also hung live shad to tempt hybrid. Although we had a few takers, there were no keepers in the mix, but we did get a few bonus bluecat which gave Tom and Jenean a good run for their money. 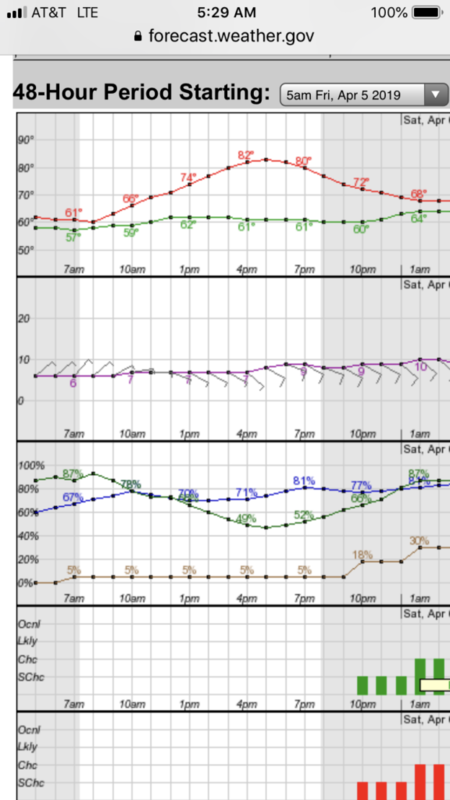 Later, a moderate-density fog moved in for about 1.75 hours and the winds calmed at this same time. The fishing fell off during this time. After the fog cleared we found a few more fish and caught them on the slab, and gave live shad another shot, but added precious little to the tally. We wrapped up around noon with 26 fish landed, including a mix of white bass, short hybrid, crappie, bluecat, and drum. OBSERVATIONS: No shad spawning observed. Water still high 62 to low 63 degree range, after falling thanks to last weekend’s coldfront and lack of direct sunlight this week. Sky Conditions: 100% grey cloud cover with the addition of fog for about a 2-hour span starting about 90 minutes into the trip.